There’s lots of ways to arrive at a website. Let’s learn how to use Google Analytics to find out where your visitors are coming from. After you log into your Google Analytics account, go to > Site Content > All Pages. Here you will see the pages of your site in order of popularity for the time period you selected. Most likely you will see a “/” in the first spot. That is the home page of your site. Let’s find out how your visitors found your site. Go to Acquisition > All traffic > Channels. Organic search – Someone visited your site after searching for a keyword and your site came up in the search results. Ex: If you type “website design” in Google search, Virtual Vision will come up in the results. Direct – Someone typed in your business name specifically to visit your site. Social – This category is for all social media sites that link to your website in some way. Other – If you have the “social media campaigns” service by Virtual Vision, these visits will be listed as “other”. How can you improve on people finding your site? 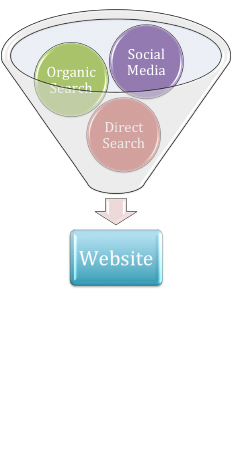 Maybe add more social media interaction, keywords for organic search, or branding for direct search.